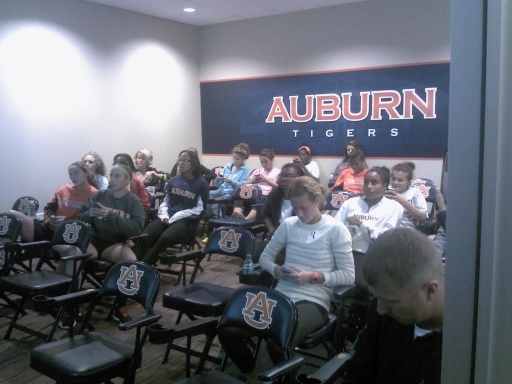 The Tigers (and their cell phones) watched on Monday as the NCAA selection show slotted Auburn into tonight’s first-round matchup against Washington. When the Auburn soccer team saw its name pop up on the big screen Monday afternoon during its NCAA selection show viewing party, the first thing the Tigers did was celebrate. Head coach Karen Hoppa and the rest of the coaching staff took a moment to congratulate the Tigers on reaching the tournament for the seventh consecutive year, and briefly looked back on the late-season run the Tigers strung together to make it all possible. Then, while the team was still celebrating, the coaching staff made a mad dash to get travel logistics in order. That’s because the Tigers were selected to open the tournament on the road in the first round against Washington — as in, the Washington Huskies Washington; as in, Seattle all-the-way-across-the-country Washington. The Tigers made their trip west safely on Wednesday. Now all there’s left to do is play the match, set for a kickoff at 9 p.m. locally. Auburn enters tonight’s game after another postseason run in the SEC tournament, when the Tigers made it all the way back to the tournament title match before losing to No. 8 Florida, 3-0, in the final. The Tigers managed to upset No. 20 Tennessee and No. 15 Texas A&M in the quarterfinals and semifinals along the way, boosting their resume and lifting them off the tournament bubble and into the 64-team field. The team’s seventh-straight tournament appearance means that the Tigers’ senior class will walk away from the Plains having made it into the NCAA’s in each year of their Auburn careers. For Nicholson, who was named to the SEC All-Tournament team alongside senior goalkeeper Amy Howard and sophomore forward Tatiana Coleman, keeping up the level of play that led the Tigers to the SEC tournament final will be key as the Tigers enter the NCAA tournament. Putting that loss to Florida behind them will be key for the Tigers going into tonight’s match, as they hope to bring back some of the momentum the team was riding late in the season and into the conference tournament. For Coleman, the team’s leading goal-scorer with 9 goals on the year, that just means that the team needs to go back to doing what it does best. The winner of tonight’s match will move on to the tournament’s second round to face the winner of the match between Utah State and No. 2 BYU. Tonight’s match will mark the second time in school history Auburn has squared off with Washington on the soccer pitch. The Huskies came to the Plains and defeated Auburn in the first round of the NCAA tournament in 2004. “We’ve had some crazy draws,” Hoppa said. “We’ve played Cal a couple of times. We played Washington here. When I was the head coach at UCF, we had to go to Madison, Wisconsin, so that was a bit crazy. I had nine kids that had never seen snow and it was 20 degrees and snow flurries. So it’s that time of year. “You get something wild, and you get something exciting, and you never know what to expect. Now we know, and now we’ve got work to do. Related: Here’s your Tatiana Coleman Scores With 32 Seconds Left In Double Overtime To Beat Bama pictogram.